Several of my clients are in the construction industry and contact me on a regular basis for photography on the ground and drone photography and drone video from the air. Jarvale Construction are based in Chesterfield and have contacted me a few times now to document and photograph their projects. Some are works in progress and some are finished jobs. 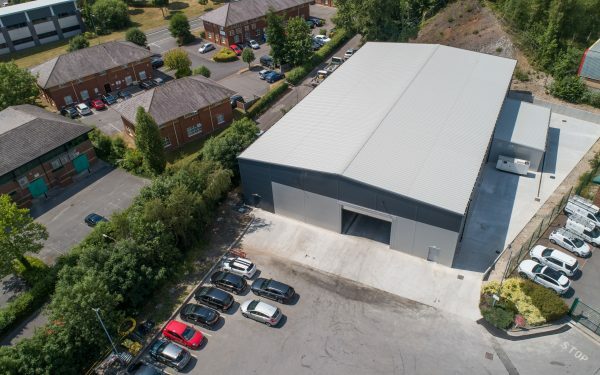 The video below was of a finished project for their client Cathelco and they wanted a short (under a minute) aerial video showing the new building they had erected on site. This is the first question you should ask if you are contemplating hiring a drone company for any aerial photography or aerial videography for you or your business. I have been Civil Aviation Authority (CAA) approved and flying drones for several years and I’m separately insured for drones as well. Drones normally fly outdoors and get their stability from being in contact with over 15 satellites to pinpoint and hold their GPS position . . .but . . .the drones I fly are just as capable indoors as well as they have downward looking radar that stops them drifting when flying and shooting inside a building. To see the video full screen . . .